GWMA Director Ken Locke leading the prayer of remembrance. 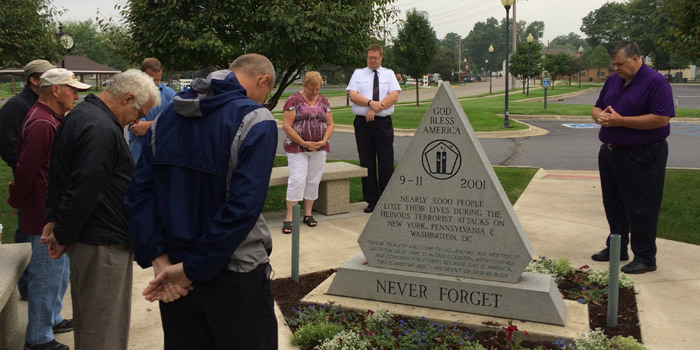 WARSAW — Residents from across Warsaw today gathered around the 9/11 Remembrance Memorial in Central Park to join Ken Locke, Director of the Greater Warsaw Ministerial Association, in prayer for our country, and for the lives lost on Sept. 11, 2001. All sorts of social work facilities were represented at the gathering, including World Compassion, Combined Community Services and Salvation Army. Locke made it clear that there was nothing too formal about the occasion, but that the group certainly wanted to take the time to remember the event. He noted that when Sept. 11 happened, people flooded to churches throughout the U.S., and hopes that people will continue to flood the churches despite the culture today. Rain gently fell as around 10 people began praying for the country. At 8:46 a.m., which is the time the first plane struck the World Trade Center, there was a brief moment of silence. Mike Cox, co-director of the 9/11 Memorial Remembrance Committee joined the group and reminded everyone of the event happening at 6:30 p.m. in Central Park.